In 2017, new changes are manifesting themselves in the international political situation around the Korean Peninsula. The United States, with the new Trump Administration, is moving to change the former Obama’s “Strategic Patience” to a more active strategy, which is yet uncertain to public. China and Russia are seeking to adjust their policies toward the two Koreas to be more balanceable and devoted to their own national interests. Japan, however, is sticking to put her ?immaculate? sanction on North Korea to solve the Japanese abduction issue, let alone the nuclear and missile issue. The political and military relations among the US, Japan and South Korea became more solid in 2016 after signing the intelligence-sharing pact (GSOMIA) between Japan and South Korea on Nov.23. It is too skeptical to tell that Japan’s current approach is aimed at fulfilling its obligation toward the past history, which refers to addressing the colonization and war. And it is not very likely that Japan’s foreign policy will significantly change in the future. Furthermore, because Japan put its relationships with South Korea and the United States before its relationship with North Korea, without making significant efforts to improve the latter, it may be favorable for South Korea if Japan’s Northeast Asia policies maintain their current course. However, even if we consider the fact that the current US-Japan alliance makes it difficult for Japan to implement its own foreign policies. The Japanese government has already openly acknowledged that normalization of its relationship with North Korea represents its historic obligation of addressing the last remaining post-war issue. Through the North Korea-Japan summit and the Pyeongyang Declaration in September 2002, North Korea and Japan reached an agreement on settling the past history and achieving economic cooperation. Two countries reconfirmed the declaration at the negotiation between the governments held in May 2014 at Stockholm, Sweden. While it is theoretically possible that Japan may avoid dealing with the issue with North Korea if North Korea collapses on its own and South Korea reunifies the peninsula, diplomacy in Northeast Asia premised upon the North’s self-collapse will not be feasible, if the past seven decades are any indication. This paper explores what strategies Japan has been pursuing in historically and at the present time and space, how those strategies affected the Korean Peninsula, as well as the direction for improving the North Korea-Japan relationship. After the end of the World War II, the United States sought disarmament and democratic reform of Japan, and established the Peace Constitution, which reconstructed the new Japan. The US’s stance, however, changed Japan into an US ally due to elevated tension between the US and the USSR, as well as establishment of the communist China. Throughout the Cold War Era, the US utilized Japan as the rear base for its Northeast Asia policies, and fortified the US-Japan Alliance mainly through reinforcing capabilities of Japan’s Self-Defense Forces. When the Cold War ended in the 1990s, the US-Japan alliance based on the anti-communism ideology had to be reorganized to accommodate this change of environment. When the United States reinforced the US-Japan alliance to include Japan in the multilateral cooperative frameworks (allied forces, etc.) against new enemies (Islamic extremists, terrorists and the oil cartels, etc.) and to use Japan’s forces for the purpose of collective security, the Japanese government moved in the same direction. In particular, after the multiple terrorist attacks on US soil in September 2001, the focus of the US foreign policies shifted from deterrence to preemptive attack and defensive intervention. The US support for Japan also changed its course from deterrence to defensive preemptive attack. By enacting the three laws related with response to armed attacks, Japan legislated its intention to offer active cooperation for the US-Japan alliance. As a result, the three pillars of Japan’s diplomatic policies after the War—Adherence to the Peace Constitution, Principle of Exclusively Defensive Security, and Anti-nuclear—were rendered meaningless. Thus, the basic frame of the US-Japan alliance was oriented toward reinforcement of Japan’s roles, which was the intention of the United States. On the other hand, however, Japan actively sought to follow the US policies, as illustrated by the provisions in the Liberal Democratic Party (or Jiminto, hereinafter referred to as “LDP”) platform that expresses the party’s plan to “maintain the US-Japan Security Treaty,” “amend the Peace Constitution” and “normalize the Self-defense Forces” (Article 6, Amendment of the Current Constitution). 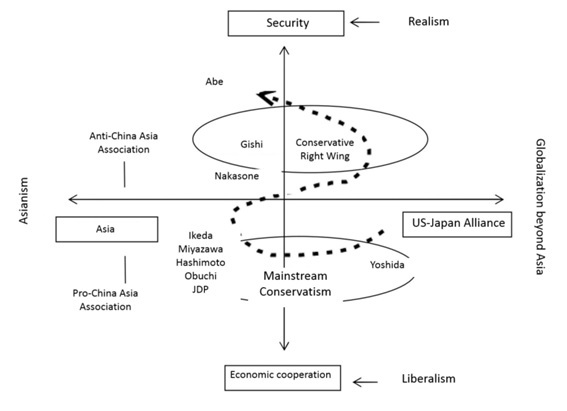 The change of Japan’s foreign policy framework can be expressed by the following diagram, where the ‘security-oriented’ and ‘economic cooperation-oriented’ line forms one axis, and the ‘US Japan Alliance-oriented’ and ‘Asia-oriented’ line forms the other axis. Japan’s foreign policies have been progressing along the zig-zag line on the coordinate system, with the current government led by Prime Minister Abe having established a strategy that puts emphasis on the Asia-Pacific region based on the framework centered on security, anti-China, and cooperation in Asia. The Ikeda administration, which came into power in the 1960s, pursued the following Korean Peninsula policy: on the basis of the basic position since the Meiji Restoration Period—“Stability in the Korean Peninsula is crucial for Japan’s security.” Japan sought to cope with the division of the peninsula by maintaining amicable relationship with South Korea while conducting economic exchange with North Korea based on the principle of separation between the politics and the economy when dealing with socialist countries. Seen from another perspective, the normalization of the Japan-South Korea relationship was Japan’s move to adapt to the US’s alliance strategy in Northeast Asia, which sought to develop the US-Japan alliance and the US-Korea alliance into the triangle alliance between the United States, Japan, and South Korea. Japan’s policies in this regard can be characterized as follows. First, Japan did not recognize South Korea as the only legitimate government in the peninsula. Without causing friction with South Korea, Japan left the margin for establishing diplomatic relationship with North Korea. Second, Japan’s attempts at settling the past issues with South Korea by defining it as an issue of claims instead of [war indemnity] or [compensation] was based on the provisions of the San Francisco Peace Treaty. Third, the economic cooperative model (strengthening of economic relations through infrastructure improvement and industrialization support) is valid. This economic cooperation model is based on the priority production model named by the Yoshida Administration in 1946. The priority production model refers to determine distribution of resources and fund through economic plans, instead of leaving the distribution to the market, to enhance the speed of industrial growth. Specifically, it involves inducing production increase based on the virtuous circle between the coal industry and the steel industry, so that such growth may expand into other industries. Japan had already experimented with this approach in Manchuria, China in the 1930s, by establishing the State of Manchuria and implementing economic plans. Negotiation for normalization of the relationship between North Korea and Japan proceeded in the following order. 1) During the negotiations from 1991 to 1992 (1st Meeting ~ 8th Meeting), North Korea maintained that apology and compensation from Japan is the primary and fundamental issue, and its goal is to achieve settlement of the past issues with Japan. 2) Japan maintained its position that they should settle the matter under the title of [property claims] as specified by the Korea-Japan Treaty of 1965. In addition, Japan put forward resolution of the nuclear issue as a precondition for normalization of diplomatic relations. During the 2nd Phase from 2002 to 2004, North Korean and Japan reached an agreement to normalize the diplomatic relationship in the form of economic cooperation. Through the North Korea-Japan Summit and the Pyongyang Statement, Japan pursued policies to recognize North Korea as its counterpart for negotiation, achieve multilateral cooperation and create trust within Northeast Asia, while resolving the past and current issues between North Korea and Japan. Regarding the approach for normalization of diplomatic relationship, Japan suggested “Complete settlement and economic cooperation”. This approach was based on the approach taken for normalization of diplomatic relations between South Korea and Japan in 1965, which involves “completely and finally” settling the issues related to the past history. North Korea demanded return of cultural artifacts and personal/material compensation for personal damages to prevent the issues of the past history from turning into an issue of economic cooperation. To these demands, Japan insisted on “complete settlement and economic cooperation” repeating its previous position that the abduction issue and the security issue should be given the priority. The negotiations between Japan and North Korea for the newly-inaugurated Abe administration were held and followed by the inter-government agreement in Stockholm in May, 2014. The following table summarizes the key elements of the Agreement. 3) In case any surviving Japanese is found, consult with Japan to return the person to Japan. The Japanese administration lifted a portion of its sanctions against North Korea after verifying establishment of the said special investigative committee. It is clear that the inter-government negotiations resulted in failure in 2016, when the North Korea announced its stopping of activities of the special investigative committee and Japan reacted by canceling its lifting a portion of sanctions to the North Korea. Even if Japan’s Northeast Asia strategies constitute a sub category of its East Asia and Asia-pacific strategies unlike South Korea’s idea of the status of Northeast Asia, Northeast Asia is a region where China, South Korea, North Korea, and Russia share borders and the United States deeply intervenes for its economic and security interests. Japan is of the position that the stability and peace in the peninsula is crucial for expanding its security and economic interests in Northeast Asia, which is shared by South Korea. Japan’s North Korea policy, however, was of a dual nature which sought to improve the relationship with North Korea while maintaining the current ties with the South. After North Korea and Japan agreed on settling the past issues through economic cooperation under the Pyongyang Statement in 2002, Japan has been drawing up a roadmap toward normalization of the diplomatic relationship. However, as the relationship with North Korea oscillated between conversation and pressure without progress in terms of the abduction, nuclear and missile issues, Japan’s engagement power on North Korea came to be debilitated. Japan will have to take a cautious approach in the matter, as various possibilities of conflict of interests with other countries: with Korea, cooperation with South Korea regarding North Korea’s nuclear development; with China, the possibility of conflict with China in territorial issues. On the other hand, if Japan successfully offer “close cooperation” with the U.S. Trump’s strategy in Northeast Asia and apply the Asia regionalism to North Korea as Japan’s own economic policy at the same time, Japan’s engagement power in Northeast Asia will be enhanced in 2017. In addition, North Korea will try to include the issue of Japanese apology and compensation—omitted by South Korea in its establishment of diplomatic relationship with Japan—as the issue is one of the basic preconditions for normalization. For North Korea, the crucial leverage for implementing the future economic policies will be how to utilize the economic cooperation to come after resolution of the apology and compensation issue. Such economic cooperation will provide a precious opportunity to relieve the burden of North Korea in terms of the issue of foreign investment, as well as to proceed with improvement of economic and social infrastructure. The economic cooperation and normalization of diplomatic relationship between North Korea and Japan may have great impact on South Korea. First, it is imperative to restore and develop economic relations between the South and the North. South Korea needs to make strategic choices so as to achieve economic cooperation with North Korea regarding the economic items required by North Korea from Japan. Second, South Korea needs to look into the roadmap of the improvement of the North Korea-Japan relationship, and proceed with talks and cooperation with the Japanese government so that the roadmap will not conflict with the prospect of the South-North relationship. While Japan requires means of monitoring North Korea to see whether economic cooperation with North Korea is utilized in North Korea’s buildup of its military forces, South Korea also requires the cooperation between South Korea and Japan for exchanging opinions in advance, selecting projects and conducting post reviews, so that the bilateral cooperation between North Korea and Japan may develop into trilateral cooperation between North Korea-Japan-South Korea, or multilateral cooperation projects in Northeast Asia. It need not be mentioned that it would be far more favorable for South Korea if Japan seeks improvement of relationship with North Korea along with South Korea as its cooperating counterpart, compared to improvement of the relationship between the two with Japan maintaining strenuous relationship with South Korea. Third, South Korea needs to take the initiative in forming an economic community in Northeast Asia. Threats from North Korea have increased the investment and security risks, functioning as the factor restricting the possibility of an economic community in the region. To lower this risk, the best way would be to elevate the level of mutual dependency by strengthening economic ties between Northeast Asian countries and North Korea. To this end, South Korea should lead the formation of a regional framework for cooperation which allows North Korea, Russia, Mongolia, and other Northeast Asian countries to participate in economic ties between South Korea, China, and Japan. Regarding reunification of the divided Korean Peninsula, where the two Koreas touch each other: South Korea experiencing economic development and political democratization and North Korea struggling against capitalistic super powers to protect her own independence are key issues for the peace of global society, especially of Northeast Asia region. The four mottos of: Peace, Development, Independence, and Cooperation, are needed to pursue the global vision of a stable Korean Peninsula.